Married for nearly 40 years, they saw each other through ups and downs and now she's helping him put on his makeup, standing by him as he transitions. Today, we bring you the story of change, of a raw reality that at first triggered confusion and anger but also exposed fierce loyalty and enduring love. It was just over a week ago that the former U.S. Olympian Bruce Jenner made his big reveal on national television that he is a transgender woman. It's news that might have been more shocking, if not for all the other headlines of late. In January, the TV series "Transparent", about a transgender father of three, picked up two Golden Globe awards. That's after transgender actress Laverne Cox graced the cover of Time magazine, with a headline declaring the fight for transgender equality as the next civil rights frontier. 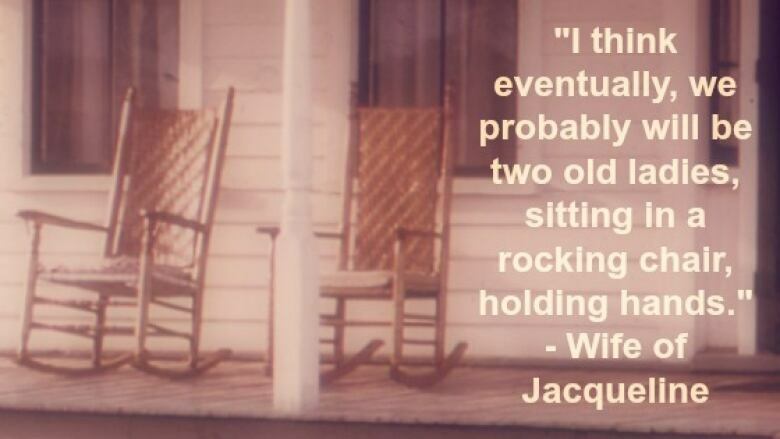 CBC's Suzanne Dufresne's documentary, Being Jacqueline, shares the story of one prairie couple — senior citizens — who after almost forty years of marriage thought they had discovered everything there was to know about each other. They were wrong. But far from these celebrity stories, there are also the quiet struggles of people trying to reconcile how they feel on the inside with how they look on the outside.